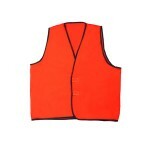 Our anti-static Fire Retardant Vests are designed to help you stay safe in case of fire. If you work in a factory or a mine, with hot or molten material, then our range of fire retardant safety vests is for you. All of our vests are fully customisable, with a huge range of fluro and hi viz colours and styles - including our reflective range, using massive 50mm reflective tape to stand out in any situation. With sizes from XS-10XL, you’re sure to find what you need. Our fire retardant vests are built from a tough, anti-static, and flame retardant material, designed and manufactured to meet or exceed Australian Standards for both flame retardant treatment and fluorescence. Add custom text or your logo with our convenient customisation service, and with our super fast shipping, we will have your custom vest delivered straight to your door before you know it. Anti-Static Flame Retardant Safety Vest - Class D Working in a factory with flammable or molten materials? Or maybe at a planned burn on the farm? 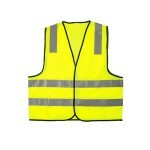 No matter what the job, our Class D anti-static fla..
Reflective Anti-Static Flame Retardant Safety Vest If you’re working with flammable or dangerous materials you need the right hi vis protection keeping you safe. Our reflective anti-static fla..